Purple Comb, 1966. Collage: ink, paint, paper, boards, sandpapered, mounted on painted board, 25 x 12-1/2. Richard L. Feigen. Wanda Gag, 1967. Collage: ink, paints, boards, sandpapered, mounted on painted board, 17-1/4 x 13-7/8. Private Collection. 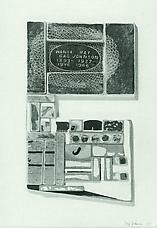 Assorted fortune cookies by that local monk of the collage, Ray Johnson, wear an Oriental mien. Buddha himself, of course, turns up, not exactly in a reverent aspect. For the rest, he assembles fragile pieces of colored cardboard and bold ink drawings, small shrines to wit, wonder and shipped cream. Excerpted from Time, May 12, 1967.